Do you like small towns and places off the beaten path and trips down memory lane? Ever wonder if old-fashioned values are still alive in America? 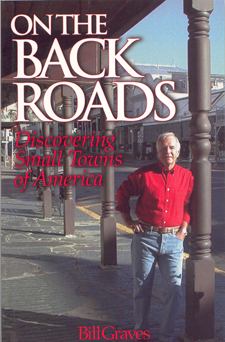 Then kick back, unwind, and hop onboard with travel writer Bill Graves as he takes you On the Back Roads. Graves has a knack for finding the quirky, the offbeat in some of the most obscure, yet fascinating, small towns on the map. Among the places and faces he discovers: a town where it’s against the law not to own a gun, a town famous for its split pea soup, the wise 83-year-old Emmy who camps alone in the desert, and a man who hunts live ants for a living. The list goes on! Retired and free to roam in his motorhome, the “RV Author,” Bill Graves, logs 40,000 miles through the western states of California, Arizona, Utah, Nevada, Oregon, Wyoming and New Mexico. Join him as he discovers hidden “treasures” throughout the journey. Armchair travel doesn’t get any better!